Originally the SHIELDSAK was made exclusively for the US military and Government departments. 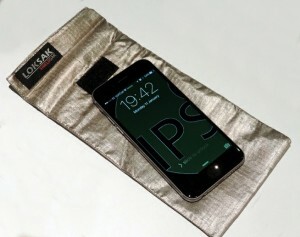 At IPS, we tested many so called ‘phone shielding devices’ only to find that most failed even the most elementary tests. Apart from general uses such as boardrooms, secure business meetings etc., law enforcement agencies will appreciate the uses of this equipment in situations where immediate shielding is critical. The SHIELDSAK is one of the only such devices to have been fully laboratory evaluated a copy of which is available on request. SHIELDSAK is a fabric Faraday cage. SHIELDSAK is a lightweight, fabric bag that blocks signals capable of reading your critical information. This bag was invented for all types of mobile devices including, but not limited to: Smartphones, Tablets and the popular iPad. When the item is placed in the SHIELDSAK and sealed correctly, the item and its file contents become invisible. All signals are blocked from entering or leaking from the bag. Phones will not ring. Items with ID chips cannot be scanned. Vital information is secure and tracking is impossible. Some devices (like the iPhone) contain a tracking device that cannot be turned off; with the SHIELDSAK, they are irrelevant. Celebrating 25 years with REI, International Procurement Services work with Government Agencies and International Companies supplying ECM equipment, Training, and Sweep Team Services.